Move the shift lever to P and apply the parking brake before bleeding the brakes. Add brake fluid to keep the level between the MIN and MAX lines of the reservoir while bleeding the brakes. If brake fluid leaks onto any painted surface, immediately wash it off. If replacing is performed with the engine running or the engine switch on (IG), DTC C1441 will be stored. Make sure to clear the DTCs when work is complete. If any work is performed on the brake system or if air in the brake lines is suspected, bleed the brake system. (a) Remove the brake master cylinder reservoir filler cap. (b) Fill the reservoir with brake fluid. Make sure that there is sufficient brake fluid in the reservoir. Do not remove the filter from the brake master cylinder reservoir and be sure to fill with new brake fluid to avoid any potential contamination of the brake system. Contamination, for example by dirt particles or mineral oil, could lead to functional brake problem. Bleed the brake line of the wheel farthest from the master cylinder first. (a) Connect a vinyl tube to the bleeder plug. (b) Depress the brake pedal several times, and while holding down the brake pedal, loosen the bleeder plug*1. 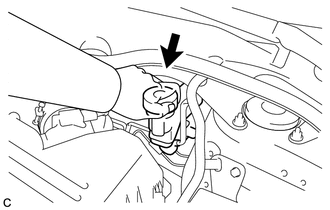 (c) When fluid stops coming out, tighten the bleeder plug and release the brake pedal*2. (d) Repeat steps *1 and *2 until all the air in the brake fluid is completely bled out and the new brake fluid comes out. (e) Tighten the bleeder plug completely. (f) Repeat the above steps to replace the brake fluid of the brake lines for each wheel.